Tim Eriksen will lead a Shape Note (Sacred Harp) Singing Workshop on Sunday, February 24 from 2:30 to 4:30, a $10 donation is requested. This is your chance to get a high-quality introduction to this kind of choral music. No experience is necessary. This singing school is for beginners and for those who want to deepen their knowledge of Sacred Harp music. There is a Sacred Harp singing in Nelson, NH, every second Sunday from 2 pm to 4:30 pm in the basement of the Nelson Congregational Church. Shape note (sometimes called “sacred harp”) singing is a tradition of harmony singing originally developed to enable people with little formal training to quickly learn new songs. Participants divide into four groups and sit in a “hollow square” arrangement, taking turns choosing and leading each song from the center. In the sheet music, the head of each note is written with a shape corresponding to its place in the scale, and the singers first learn the tune by singing it using the names (fa, so, la, mi) of the notes in place of the text. While shape note texts are mostly hymns and form a part of church services in some religious traditions, most singings now are community events and many non-religious participants come for the intense feeling of community that comes from singing in harmony together. Tim Eriksen’s work as an ethnomusicologist and teacher has included extensive research on shape-note music in New England and the venerable Sacred Harp four-part harmony tradition. He is a founder of what is currently the world’s largest Sacred Harp singing convention, in Northampton, MA and has taught hundreds of hour- to week-long workshops and seminars in shape-note harmony singing, American music history, ballad singing and instrumental accompaniment at festivals, universities, museums and arts centers, including the Smithsonian Institution, Harvard University, the Society for Ethnomusicology Convention, Colours of Ostrava Festival (Czech Republic), Camp Fasola (Anniston, AL) and the Early Music Festival in Jaroslaw, Poland. 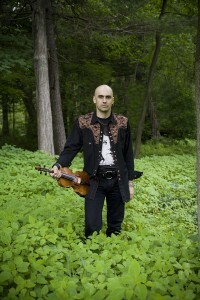 Tim and his band, ‘Trio de Pumpkintown’ will present a concert at 7:00 PM featuring traditional music from New England and beyond including selections from their new album “Josh Billings Voyage”. Concert admission is $15/$12(senior, youth and advance) and is a separate event.